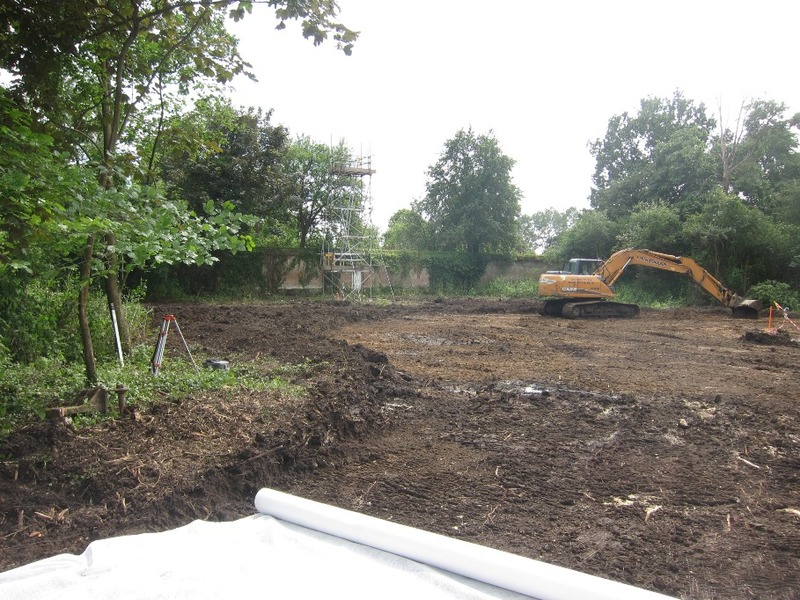 Monday 20th June saw the start of building work of the new opera house at West Horsley Place; the Theatre in the Woods. The woods in question have colonised the ancient Home Pittles, originally a paddock located close to the main house, just north of the orchard. The first task for the builder was to clear the trees and undergrowth occupying the footprint of the new building. This followed an archaeological survey in May resulting in no discoveries, not even Sir Walter Raleigh's head which some say is hidden somewhere on the estate, and ecological surveys assessing the possible presence of badgers - scrapings but no sets - crested newts - none - and bats - no roosts in the trees since they mainly choose the comfort of the estate outbuildings and the attics of the main house. Now underway is the stripping of the top soil and preparing the site for the driving of piles: 146 of them ranging in depth between 12m and17m. The subsoil is heavy clay and accordingly the groundworks, which includes the sub structure and the shell of the undercroft containing the orchestra pit, back stage accommodation and the natural ventilation labyrinth, are likely to continue to October. The construction of the superstructure, comprising the 230 tonnes of steel frame and the pre-cast concrete floors and roof, will immediately follow on. All this is being filmed by a time lapse camera which will send out a visual record of progress for all to witness and be amazed.